It’s the end of the season, and you’ve pulled everything you can out of your garden. And suddenly you find yourself with more jalapeño peppers than even the most staunch lover of spicy food could ever use. What to do? Make like Peter Piper, of course, and pickle them! Thanks to a little research last harvest season, I’m no stranger to canning. This year, though, I haven’t been feeling the canning love. Despite being a really awesome way to preserve things, it takes a lot of time and can be messy. Plus, the jar tongs I have? Not safe. Who designs jar tongs that can pop apart when you’re lifting a hot jar out of a canner full of boiling water? (This hasn’t actually happened, thank God, but they’ve come apart often enough that it’s a very real possibility.) They’ll need replacing with a more reliable pair before it comes time for chutney. If you’re not feeling up to canning, either, or you don’t have a canner, or whatever…you can still make these pickles! That’s because they’re refrigerator pickles, a wondrous thing that I only recently discovered. The only time you need to spend is the time it takes to slice up the peppers and boil the pickling liquid. Everything else takes care of itself! This recipe is a variation on the 2-page spread in a recent VegNews, which yielded me some pretty amazing pickled cauliflower a few weeks back. It works equally as well for jalapeños! Just a warning, though: these are very spicy. Hot food lovers will be thrilled, but if you’re sensitive to heat in what you eat, be cautious. 1) Clean your jars, lids and rims thoroughly in hot, soapy water. Dry everything and set the jars up near your pepper prep surface. 2) Wash your jalapeños, then decide if you want whole pickled peppers or slices. (If you have sensitive skin, you might want to wear gloves for this part.) For whole, pierce or make a small cut in three sides of each pepper before putting it in the jar. For slices, cut off the tops of the peppers and cut the rest into rounds. Pack the jars with peppers, then evenly distribute the pickling spices and garlic between the jars. 3) In a medium saucepan over high heat, bring the water, apple cider vinegar, sugar, and salt to a boil. Lower the heat and simmer for 5 minutes, stirring occasionally, until the sugar and salt are dissolved. 4) Pour the hot pickling mixture into the jars, then secure the lids and rims. Let sit until the jars are room temperature, then store in the fridge. Wait at least 2 days before trying your pickled peppers. 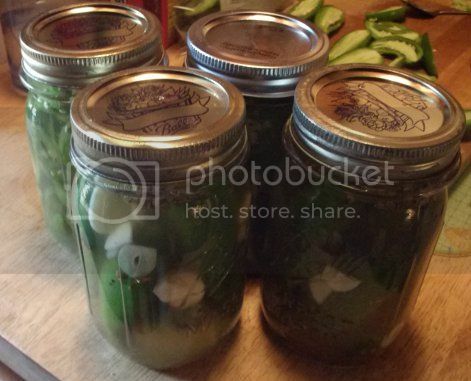 Refrigerator pickles will keep about 3 months, so be sure to enjoy them! Great post, I am bookmarking it for when my plants produce jalapeños! I have been looking for a hot pepper pickling recipe since I have quite a few left from my CSA. This is perfect! One question though – what constitutes “pickling spices”?